WHAT IS GALAXYCOIN? Anyone is free to join Galaxycoin.io as a basic trader and purchase any of the assets offered. Galaxycoin provides a level of security and trust that traditional blockchains and crypto-currencies cannot offer. Galaxycoin is a permission based blockchain. This type of blockchain is designed to have multiple centralized authorities who manage inventory and connect real world assets to blockchain. These authorities are trusted authorities who will prove their trust by delivering real products or services linked to a blockchain. Since no single authority can make all management decisions the blockchain is essentially a decentralized group of centralized authorities. If any one of these authorities commits an act of fraud it takes the entire community to vote on removing them from the chain. Anyone can be a trusted authority as long as they are accepted by the community and can prove that they will carry out their duties in a responsible and lawful way. Centralized organizations such as small or large businesses in banking or inventory management have a history of trust from an established client base and are usually the best candidates to become miners and distribution channels. With traditional blockchains there is no way to build a trusted blockchain community. As long as criminals exist, as a community we have to assume they will try and join and take advantage of blockchain networks. This is a proven ongoing problem because traditional blockchains have no way to control spam, fraud and criminal activity which allows criminals to continue to exploit others and reduces overall trust in the platform. Galaxycoin (GXY) is a privately controlled asset based crypto-currency traded using blockchain technology. Galaxycoin is backed by fiat currency and real precious metals and is based on “The Gold Standard”. The Galaxycoin public transaction ledger can be viewed at Galaxycoin.info. You can start trading assets and using fiat currency by signing up for a free account or navigate to My Account and click New Account. Galaxycoin is not like other cryptocurrencies because it is a privately managed assetchain network. Galaxycoin is a crypto service which backs each cryptocoin by gold, silver, fiat currency and other precious metals. With a Galaxycoin account clients can transfer virtual assets and currencies to other accounts with only a few clicks using a PC or mobile device. 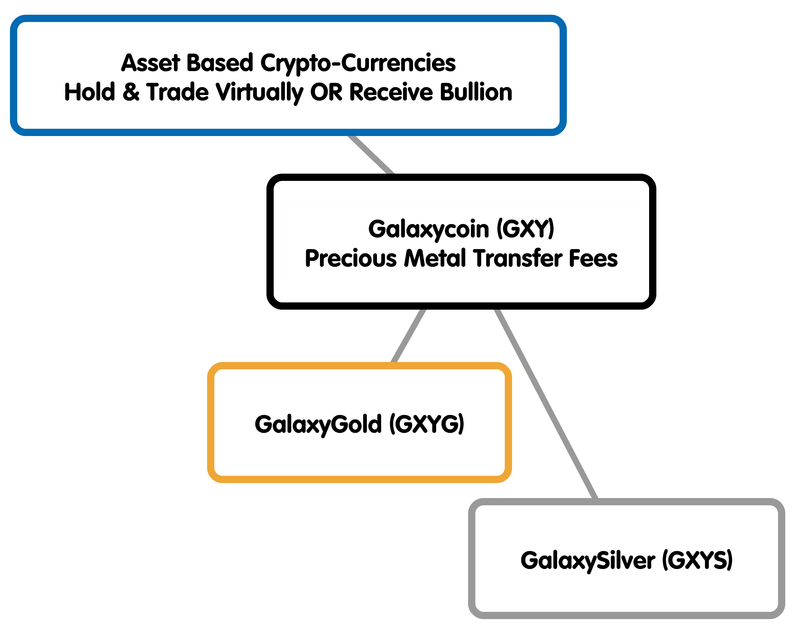 The price of Galaxycoin assets are pegged to precious metals and are represented in grams. The value of Galaxycoin assets is the same value as gold or silver. For example, you own ten GalaxyGold coins which is equal to ten grams of gold. If the value of gold is currently 43 $USD/gram you have a crypto-asset that is worth $430.00 USD. If the value of gold increases your asset increases, if it decreases your asset decreases. HOW CAN I SEND/RECEIVE GALAXYCOIN? The Galaxycoin.io platform started in 2016. The BETA production wallet was released in 2018 and is available online. There is no need to download wallet software. Users can manage all Galaxycoin.io account features using the site map. Galaxycoin provides liquidity for asset investments only. There is no liquidity for Galaxyshares. Galaxyshares will be available for trading on exchanges. Buy and trade Gold using Galaxycoin. If you want to liquidate your asset you can receive gold bullion. There is no cross-platform software and no third parties. Third parties may not be trusted, usually add overhead fees and can compromise security. As many people probably realize it can be difficult to invest in crypto-currencies. Most are too volatile for long term investment and have no solid asset to back them. It is also difficult to find places to buy or sell crypto currency. We have taken that hurdle away and make it simple to buy and sell crypto-currency by combing the buy and sell process all in one place. Galaxycoin makes it very simple to purchase and hold precious metals. Currently you can purchase Galaxycoin (GXY), Galaxyshares (GXYR), GalaxyGold (GXYG) and GalaxySilver (GXYS) using, Bitcoin (BTC), Ripple (XRP) or direct bank deposit. You can hold and trade any of these assets using your account address and your online wallet. Galaxycoin (GXY) is primarily used for basic trading and is pegged to the US dollar. You can purchase Galaxyshares as investment which could potentially grow in value depending on the volume of clients interested in Galaxyshares. Galaxyshares can only be liquidated through third parties such as trading sites and personal one-on-one exchanges. If you want to have the option to hold or liquidate real assets you will need to purchase GalaxyGold (GXYG) or GalaxySilver (GXYS). Miners are selected by evaluating how they will benefit the Galaxycoin network. Currently a corporate entity can request to mine Galaxycoin but mining is not the same as Bitcoin and rewards are not based on proof-of-work. Mining is currently restricted to corporate entities who can prove their business model and add value and trust to our services. A project fork happens when developers take a copy of source code from one software package and start independent development on it, creating a distinct and separate chain. Every so often you may hear this term in blockchain development. Software updates will be transparent and will not affect your account balance in any way. Also, be aware that in the future, wallet access may also be hosted on multiple trusted domains. Based on client feedback we are discussing additional portfolio minerals. Lithium was one recommendation which we may add to our asset list this year. Mineral assets such as lithium will have specific liquidation rules. We have a new production wallet this year. This wallet gives users full control of their private keys and access from any browser or mobile device. The Galaxycoin.io sign up process is a lot easier and we have opened up investments from anywhere in the world not just US residents. If you are looking for a smart contract blockchain application, you can also check out SlapStick.io. We launched this application in 2018 and expect a lot of interest. Our core blockchain software has been well tested and has been running since 2016. There may be some bugs and problems with our wallet software, purchasing assets and liquidation. We are working through these bugs and with the help of the community we can address new bugs as quickly as possible. Don't panic if something does not work correctly. Send us a message if you encounter something that does not appear to be working correctly so our development team can fix the problem ASAP. Be aware who you are dealing with to avoid phishing scams. Get into the habit of checking your browser address. There are websites who may look like Galaxycoin.io but have nothing to do with Galaxycoin.io. Galaxycoin.io has no affiliation with thegalaxycoin.com, galaxycoincrypto.com, galaxycoin.com and many others with similar names. Check your browser address and be sure you are viewing a "DOT IO" address. There are apps in the Android store that may look like Galaxycoin.io. Do not think you own precious metals by using this app. They have nothing to do with Galaxycoin.io and currently no mobile app exists for Galaxycoin.io. Since Google is likely to ban most crypto related mobile apps we do not have any plans to write an Android mobile app at this time. Galaxycoin.io does not want clients to lose blockchain access because of bans. Currently no Galaxycoin.io assets/coins are being traded on exchanges. We may add Galaxyshares (GXYR) to one exchange but no date has been set. All assets and coins can be bought directly using the Galaxycoin.io online order form and traded using a web wallet.